KATHMANDU, March 19: Stocks opened trading on a slightly positive note as the Nepal Stock Exchange (Nepse) index climbed more than 3 points in the afternoon. However, the index could not cross 1,165 points mark and posted a steady decline in the remaining trading hours. Eventually, Nepse shed 7.47 points to close the day at 1,153.98 points. Nepse gave up all its Sunday's gains in the trading session as the index failed to extend its winning run. The correction in the day can also be partially attributed to profit booking by short term traders. Nonetheless, the equity index is trending almost 50 points above March's opening level suggesting fairly bullish sentiment prevailing of late. Meanwhile, over Rs 360 million worth of shares changed hands. Barring two major sectors, all major subgroups closed in the red. Finance and Manufacturing & Processing sub-indices climbed 0.71 percent and 0.38 percent, respectively. Losses came mainly from insurance and energy sector stocks. Sub-index of Life Insurance registered a loss of 1.27 percent while that of Hydropower and Non-Life Insurance surrendered 1.21 percent and 1.1 percent. Next, Microfinance sub-index declined 0.76 percent lower. Bellwether Banking stocks' sub-index also closed 0.63 percent lower. Global IME Bank Ltd promoter shares were traded the most as it witnessed a total transaction of Rs 64 million. 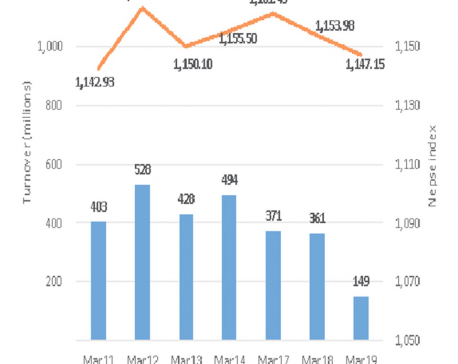 Subsequently, shares of Shine Resunga Development Bank Ltd, Everest Bank Ltd and Nepal Life Insurance Company Ltd posted turnovers of over Rs 14 million, Rs 12 million and Rs 10 million, respectively. Other active stocks for the day include shares of NMB Bank Ltd, Shikhar Insurance Co Ltd and Nepal Investment Bank Ltd.
Shares of United Finance Ltd posted the biggest percentage gain in the session. Following its rally of 8.72 percent, it has extended its gaining streak to four consecutive sessions. Multipurpose Finance Company Ltd also surged 7.14 percent in the day. Similarly, other gaining stocks were Asha Laghubitta Bittiya Sanstha Ltd, Sindhu Bikash Bank Ltd, Shree Ram Sugar Mills Ltd and United Modi Hydropower Ltd with advances of over 4 percent each. On the other hand, Janautthan Samudayic Laghubitta Bittiya Sanstha Ltd turned in the worst performance of the day. Its share price tanked over 5 percent. Khani Khola Hydropower Co Ltd also tumbled almost 5 percent. Meanwhile, Rairang Hydropower Development Company Ltd, Api Power Company Ltd and Kalika Laghubitta Bittiya Sanstha Ltd saw losses of over Rs. 3 percent each. On the corporate front, Hathway Finance Co Ltd has called for its Annual General Meeting (AGM) on April 9. The finance company, which is in due process to be acquired by Global IME Bank Ltd, is also cancelling its earlier announced 180 percent right shares. ARKS technical analysis indicates a bearish candlestick formation as the index posted loss after failing to cross 1,165 points mark in the day. Technical indicators suggest slightly subdued momentum in the present context despite the general outlook remaining fairly bullish. Hence, cautious trading is suggested in the current scenario with further upward movement plausible only after a breach of 1,165 points to the upside. KATHMANDU, March 20: The Nepal Stock Exchange (Nepse) index climbed up by over 4 points in early trading on Tuesday.